This year’s climate change conference was full of good intentions on how communities, organizations and businesses are aligning their efforts to reduce temperature increase. However, while COP23 delegates from all over the world just finalized their discussions on the framework of how to achieve the Paris Agreement targets, the goals become more challenging to reach. In its study “Climate Change: Closing the COP21 Gap by Going Solar” REC Group, the leading European brand of solar panels, already highlighted right after the Paris Agreement, how solar can be a key pillar in mitigating emissions and supporting in abating climate change. However, there is a shortfall between the emissions gap to limit temperature increase to below 2°C. To be on track by 2025 to close the emissions gap of the 1.5°C target and avoid further accelerating climate change impacts, the potential solar capacity ramp-up has to be up to 4,800 gigawatts (GW) larger than industry analysts have been forecasting before the Paris Agreement. To put this in perspective: by end of 2016, 303 GW of solar PV capacity has been installed globally. If the emissions gap is not closed by 2030, it is extremely unlikely that the goal of holding global warming to well below 2°C can still be reached: The United Nations Environment Program (UNEP) has recently published a report about the emissions gap. Avoiding building new coal-fired power plants and phasing out existing ones is crucial to closing the emissions gap. The solar energy sector has an annual emission reduction potential of 3 to 6 Gt of CO2 equivalents in 2030. Solar power capacity can reach 3,725 GW in 2030. This potential would require a growth of the installed solar PV capacity of 14 to 20% per year. Closing the emissions gap will require a sharp ramp up of investment into lower- and zero-carbon sources: As outlined by Bloomberg New Energy Finance and CERES, forecasted investment into renewable energy power generation will increase by 75% compared to a Business As Usual (BAU) scenario over the next 25 years. 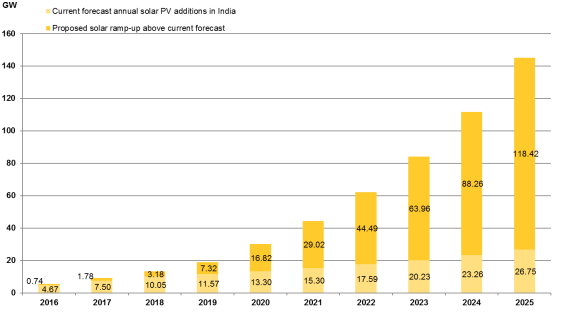 This represents a Capex of USD 12.1 trillion (USD 484 billion on average annually). REC’s calculated capacity ramp-up of solar PV will require an annual investment of up to USD 157 billion in 2025. The global annual fossil fuel subsidies of around USD 500 billion are much higher. Universal Ecological Fund is claiming in a recent analysis that climate change will cost the US around USD 360 billion per year. Solar PV technology is the key pillar in transforming global energy: Considering higher future electrification rates which are also part of climate policy strategy and REC’s forecast for the 1.5°C target, this will result in around 20% of solar’s share in the global electricity mix. This seems to be in line with a recent study by Energy Watch Group, presented during COP23, in which a transition to 100% renewable energy is feasible as early as 2050. In this scenario, solar PV will make up 69% of the global energy mix standing out as the most important energy technology. REC’s calculations on required capacities can be seen as a further step in planning a global power transition and implementing country specific targets and mechanisms. Many countries have started moving into the right direction and have already created success stories for renewable energy. The international community, however, still has a long way to go. 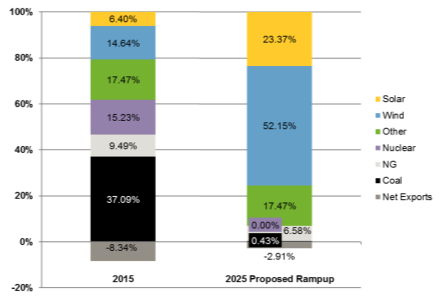 As REC analyzed in its COP21 study last year, the main driver for Germany’s high emissions was the 45% share of coal in the German electricity generation mix. Therefore, Germany’s emissions gap can be closed by 2025 by significantly reducing coal capacities. To eliminate coal as well as nuclear, Germany needs to install 8 GW of above-forecast solar capacity every year up to 2025. The proposed ramp ups will bring solar and wind to a total share of approximately 75% in the German electricity consumption mix. The set target for renewable energy to represent 40-45% in the German electricity consumption mix by 2025 is far too low to close the cumulated emissions gap by 2025 and fully exit nuclear power generation by the end of 2022. Globally, India ranks fourth on the list of highest emitters after China, the US and the European Union. According to the UNEP The Emissions Gap Report 2017, India still relied mainly on coal for its electricity generation, contributing 61 percent of total national generation capacity in 2016, but 12 percentage points less than 2013 (IEA India Energy Outlook). India will require cumulative solar installations of 374 GW above the forecast by 2025 as calculated by REC in 2016. Yet, serious efforts to contribute to the fight against the climate change can be seen. India plans to install 175 GW of renewable power by 2030 which includes 100 GW of solar PV power. In 2016, 4 GW of solar powered capacity was added to the grid doubling the addition of 2015. According to the REN21 Renewables 2017 Global Status Report, India’s rooftop solar market has expanded significantly in recent years, but accounted for only about 10 percent of the country's total solar PV capacity at the end of 2016. Financial, regulatory and logistical challenges have hindered growth, and India remains a long way from its rooftop target of 40 GW by 2022. Despite withdrawal from the Paris Agreement by the White House, a movement towards cleaner energy standards and carbon footprint reduction is evolving in the United States, which is the second largest emissions emitter worldwide. Especially on the federal and municipal level, governments are preparing for the energy transition. In total, 29 states have established Renewable Portfolio Standards. The state of Hawaii has already pledged to be 100% renewable by 2045. According to the REN21 report, in 2016, solar PV has become the country’s leading source of new generating capacity. More than 14.8 GW of capacity – almost double the installations in 2015 – was brought online, for a total of 40.9 GW. Per REC’s calculations, the US will need cumulative solar PV installations of approximately 790 GW through 2025, which is four times the 2015 forecast. Postponing these efforts by 5 years will require additional 93 GW of solar PV by 2025.